Organized by Shenzhen Enterprise Association and Shenzhen Commercial Daily, VISION GROUP was ranked on the list of “2012 Shenzhen Top 100 Enterprises”, in recognition of its excellent products, overall strong completion edge , as well as contribution to local society. The event of “2012 Shenzhen top 100 enterprises” started from 2003, and has successfully organized for 10 years. It gains great reputation by its scientific and rigorous ranking system and data collecting criteria. Along with the supporting of China Association of Enterprise, Guangdong Enterprise Association, Shenzhen Research Center of Social Science and other organizations, it has become the most reputable company ranking list in Shenzhen. 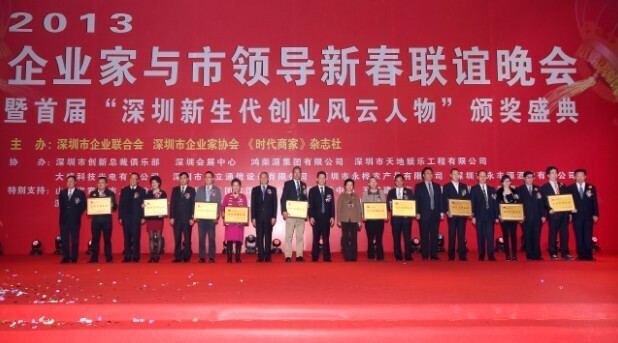 Mr. Zhang Huanong, President of VISION GROUP, attended the award ceremony (ninth from the left).